CamVerce offers the easiest way you can create professional presentations,tutorials, demos and video lectures. It has five main features that you can launch from one window, this includes recording the computer's current screen,drawing on screen while recording, editing, exporting exporting and playing interactive files to make it more involving. Launcher allows users to utilize all CamVerce applications from a single window. Recorder allows users to record computer screen, videos screen and computer screen as slides. This application can be also stated from CamVerce Launcher under Record tab. won’t play AVI file format. 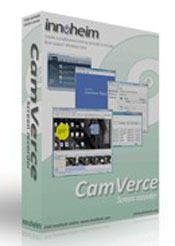 This application automatically updates your CamVerce up to date.